There is many a thing to do in the beautiful Adelaide Hills. From strolling quaint village streets, good food and great wine, to nature treks and sumptuous cheese platters with a picturesque view or hanging at local produce markets. If you have taken time to relax and unwind at your stay at CABN, and now you are looking for a local adventure, we’ve picked a few of our personal favourites to get you started! One of the many brilliant wineries in the Adelaide Hills, Deviation Road Winery is located in the picturesque suburb of Longwood and is a must see for sparkling wine lovers. The boutique winery offers guided tours across its entire premium range and shared regional tasting platters that can be enjoyed on a leisurely afternoon in the wine garden over a game of bocce. For a full list of local wineries, check out the Adelaide Hills Wine Region. Where can you find a butcher, bakers and multiple candlestick makers? The answer: Hahndorf, South Australia. This German Village – which happens to be Australia’s oldest surviving German settlement town – is the perfect place to spend a day all year round. Handmade goods, local produce, unique shopping and wine… Could we ask for more? The Seasonal Garden Cafe is a favourite organic, whole-food based cafes in the Adelaide Hills – in both Hahndorf and Stirling. The dishes on their constantly evolving menu showcase home-grown produce and food that can be enjoyed in their rustic cafe area. Along with delicious brunch options, they also have an extensive selection of raw cakes and snacks that are full of energy to keep you going on a day of adventures. Fred is the perfect all-rounder for breakfast, lunch and dinner in Aldgate. It’s simple: fantastic service and quality, strong coffee all year round. Does it get much better? The Crafers Hotel has recently had a makeover and offers an elegant, upmarket feel loved by locals and visitors alike. The restaurant offers pub classics such as a chicken parmigiana or salt and pepper squid, as well as a variety of French influenced dishes. If you are eating with a crowd or for a special occasion, one of the two set menus or the Rotisserie Platter are particularly appealing options. Step inside to experience pure temptation. The Stirling Hotel is not just a Sip N Save bottle shop, but also patisserie heaven, and conveniently located alongside Romeo’s Foodland. And if you need to top up your gourmet supplies for your stay at CABN – we’re thinking French bread, pies, pastries, cheese, craft beers or boutique South Australian wine – then pop through to the Hotel’s Cellar. The Hahndorf Farm Barn is the perfect location for family activities. The whole family – young and old – will love playing with the adorable farm animals in the engaging atmosphere. With barbeque and picnic areas available, you’ll be able to make your entire day at the Hahndorf Farm Barn a lasting family memory. Open: 10am-4pm daily, except December 24-26. 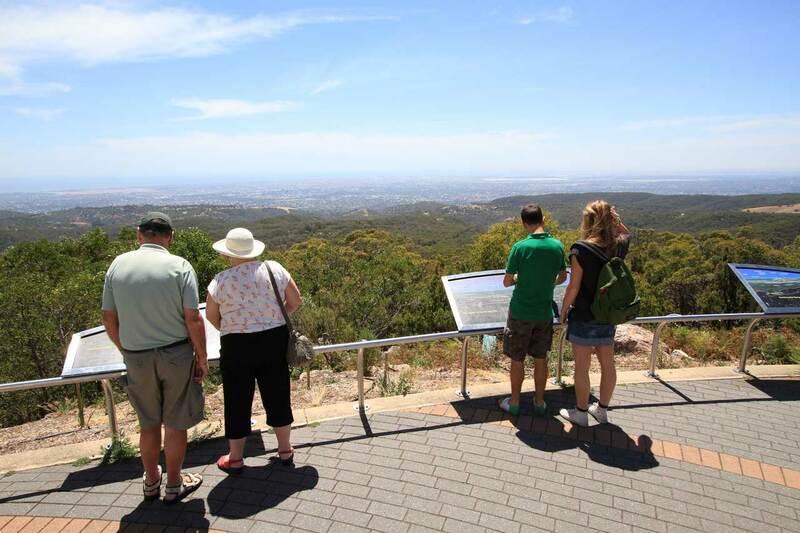 The walk to Mount Lofty summit is notorious around South Australia as a must do for both fitness fanatics and nature lovers. Starting at Waterfall Gully the hike is a 3.9km return trek and can take anywhere from one to three hours depending on whether you want to run, walk or a bit of both. The view from the summit is awe-inspiring so be sure to take your camera with you. The Adelaide Hills region has an awesome array of markets at different times of the year. Our favourites? The Stirling Market is open on the fourth Sunday of the month from 10am-4pm and features beautiful, handmade trinkets from local makers. The Stirling Laneways run monthly from September through April. Much like the Stirling Market, it’s a colourful world of handmade items, entertainment and food. In Hahndorf, the POP Market is on the second and third Sunday of the month at the Hahndorf Institute. If you’d like to find other markets like these, there’s a great list here. Looking for a refreshing nature walk or hike? Mark Oliphant Conservation Park is a short distance away from our CABN and makes for the ideal day of exploring the world around you on the 4km circuit. This challenging walk can take approximately 2 hours, so be sure to pack your hiking shoes and a bottle of water. Please note, however, that pets are not allowed in the park. If you have any suggestions on how to spend a day in the Adelaide Hills, add them in the comments below. Or if you’re looking for things to do at CABN during your stay without leaving the four tiny walls, read this.